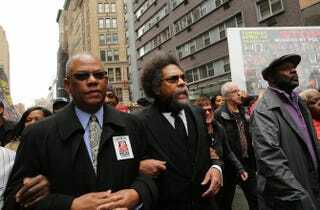 Activist and scholar Cornel West (center) joins protesters against police violence in New York City, April 14, 2015. A coalition of anti-police violence and anti-racist organizations gathered in Manhattan’s Union Square to listen to speakers before setting off on a march down lower Broadway to bring attention to police brutality. I began reading Michael Eric Dyson’s lengthy essay for the New Republic, “The Ghost of Dr. Cornel West,” with some trepidation. By the time I finished it, I was sickened. Framed as an impartial assessment of West’s so-called steep decline as a scholar, public intellectual, thought leader and writer, Dyson backdoors into a scathing critique of his former friend that felt as bruising as a series of sucker punches delivered with increasingly gleeful frequency and viciousness. The timing of the essay is jarring in this moment, particularly since it appears in the New Republic, which, until very recently, has been written primarily from a white, so-called liberal point of view. African Americans are being gunned down in record numbers by police officers and vigilantes in cities across the country, and we are living in a cultural, political and revolutionary moment of intensified black rage. This being the case, it hardly seems the time or place for rehashed Ivy League drama between two well-respected and accomplished African-American professors. Perhaps Dyson’s move shouldn’t have come as a surprise. The river of bad blood between the two men has ebbed and flowed along the banks of President Barack Obama’s two terms in the White House, occasionally crashing ashore on cable networks for the world to witness. Through it all, I’ve still closely followed both of their careers with admiration and respect. The staccato boom bap of Dyson’s words, at times punctuated with a controlled gush of alliteration as if he’s masterfully riding a beat; and the powerful Baptist-preacher thunder of West’s voice, eyes ablaze with righteous fury, his Afro a subversion of the Ivy Leagues he favored throughout most of his career. Meeting West remains unchecked on my bucket list, but I had the honor of meeting Dyson when we both participated in a diversity and inclusion event at Alcorn State University a couple of years ago. He is as brilliant and fearless in person as one would expect, laying waste to the deep-Southern-fried religiosity preferred by “sexual rednecks”—those black people whose contemptuous intolerance for gender queerness mirrors the bigotry of racist, Southern whites—with a signature fluidity that seems to come as naturally to him as breathing. Though Dyson’s work has always impressed me and continues to do so, it is West, with his unwavering stances against poverty, police brutality, political tokenism, imperialism and global terrorism perpetuated by the United States, who represents the beating heart of global black liberation. As a rarely seen video of West being schooled by Sista Souljah will attest, he has not always been this way, but since his consciousness has been awakened, he’s remained consistent. I’m not a scholar—I’m just a writer for myself and others—but I know this to be true: While Dyson was probably working on the second or third draft of his West essay last week, the man himself was marching and speaking against police brutality in New York City’s Union Square. I won’t delve too deeply into Dyson’s essay here because it’s really something to be read and digested on one’s own. However, several things stood out to me as hypocritical within a piece that felt intensely personal and vindictive. Writing that West should accept his role as a “public intellectual, social gadfly or merely a paid pest,” Dyson also calls him a vain, unimaginative, bitter, self-anointed prophet. Interestingly enough, Dyson said that he would never call himself a prophet, but the lie detector test determined that was a lie. It becomes clear that his change of heart happened around the same time that West expanded his anger at Obama to include those he felt sold out for a seat at the political table. Long before their ideological schism, however, West believed himself personally betrayed by Obama because of his (supposed) disinterest after the election. It is a sad truth that most politicians are serial rhetorical lovers and promiscuous ideological mates, leaving behind scores of briefly valued surrogates and supporters. West should have understood that Obama had had similar trysts with many others. But West felt spurned and was embittered. This condescending reading of West’s issues with Obama is reductive and disingenuous. West is angry because Obama did backbends for the GOP; folded on authentic universal health care, specifically the public option; bailed out Wall Street; and is complicit in the droning of children. His critique of Obama's evocation of Martin Luther King Jr. is valid when his global policy runs counter to what King fought for—in action, if not always in rhetoric. Dyson accuses West of being in the throes of “emotional catharsis” after beginning his piece slyly framing his former mentor as “a woman scorned.” This is typically an old misogynist hat trick to discredit the legitimacy of female viewpoints, and I was surprised to see Dyson pull it out in his essay—particularly because West is clearly not the one in his feelings here. There is no doubt that West has left himself open for retaliation from his former friends. Dyson has been publicly derided by West as being easily seduced by access to power, and he has every right to defend himself. Still, he shouldn’t disguise a festering vendetta as an aboveboard scholarly pursuit. There will be a moment of reckoning when President Obama leaves office. White feminists will become the new media darlings in preparation for Hillary Clinton’s presidential run, and Obama will no longer be the site of exploration where many black people grapple with what real black political power looks like situated within a white supremacist structure. During that moment, identity politics and neoliberal agendas won't be able to masquerade as collective advancement, and we will climb out of this rabbit hole where progressive blackness seems to be defined by proximity to the African-American man in the White House. And when that day comes, I’d be willing to place a bet that Cornel West will still be standing in his truth: scholar, activist and lover of black people, even when too many of us didn’t love him back.